The architectural scene in New York City is becoming increasingly international and one of the brightest "new" stars is Enrique Norten, who is based in Mexico City. 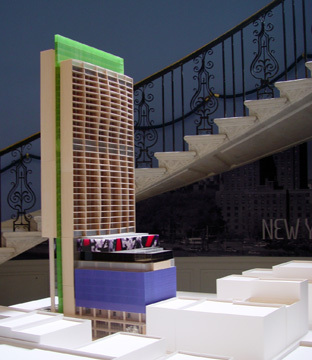 Mr. Norten's firm, TEN Arquitectos, is the subject of a nice exhibition at the Museum of the City of New York from June 7 through October 30, 2005, entitled "New York Moving Forward." 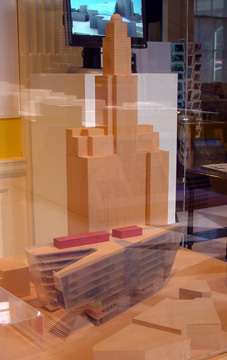 The exhibition contains renderings and models of several of Mr. Norten's recent projects including three in New York City that not only will enhance his reputation but significantly move the city back into the mainstream of architecture creativity after a much too long hiatus. The most important of these New York projects is Harlem Park, a 34-story structure now under construction on 125th Street at Park Avenue, which is certain to become Harlem's most important landmark. 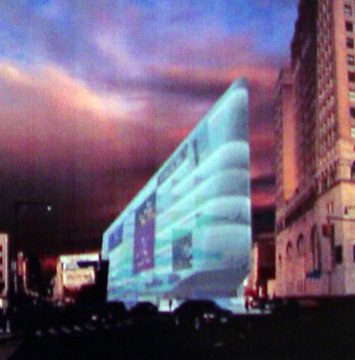 The building, shown above, is a bold and sophisticated design that is most notable for undulating grid of its eastern facade. The tower's slab is aligned along the north/south axis. The middle of the slab is green and the top section of the eastern base of the project is blue and contains five floors of office space. The bottom of the base contains about 55,000 square feet of retail space and a terraced banquet level. The tower will contain a 204-room Marriott Courtyard hotel, 185,000 square feet of office space and the top of the tower will contain 110,000 square feet of apartments. The tower is across from the 125th Street Metro-North rail station. Majic Development Group is the developer of the $220 million project. 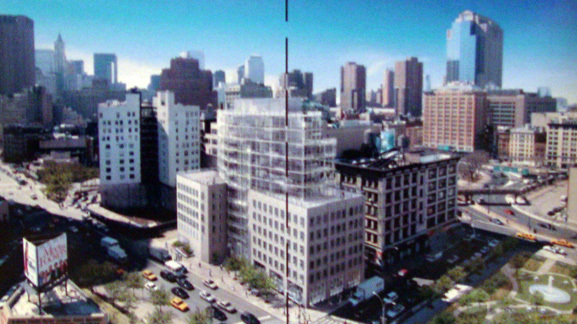 The hotel will be the first major new hotel in Harlem since the closing in 1966 of the Hotel Theresa. The project originally was planned to be about 550 feet tall but was lowered to about 453 feet. What is perhaps most striking about the project is that Norten's design studies for the project are superb. Ideally they should all be built. Often the best design studies are overtaken by political and economic compromises and while this project has been reduced in height it still remains as a tremendously exciting design that will become a major New York City landmark. 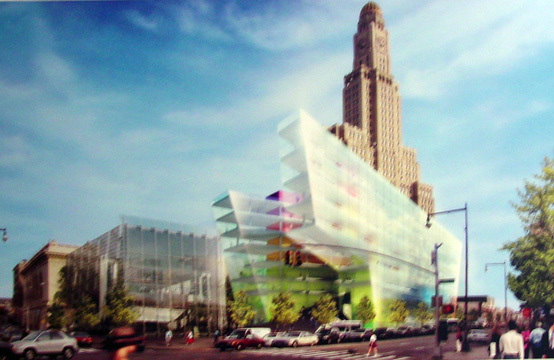 Norten's Harlem Park design gives not hint of his plans for the new Brooklyn Public Library for the Visual and Performing Arts close to the Brooklyn Academy of Music and the Williamsburgh Bank Tower and very close to the huge new arena and housing complex that has been designed by Frank Gehry for Forest City Ratner. Plans for that complex were made public recently and then another developer, Extell Management, submitted a competiting plan for the same site that is smaller and not as exciting and hopefully will not be accepted. 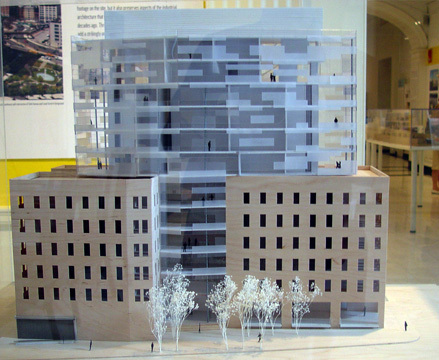 The Gehry/Ratner scheme calls for a phalanx of tall towers, many that rise at angles. Combined with Norten's design for the library, this location could well become one of the most exciting places in the entire city. All that would be missing would be the Brooklyn Dodgers. Norten's design for a residential expansion of old industrial building at 1 York Street in the TriBeCa section is less radical than the Harlem and Brooklyn projects, but it demonstrates Norten's impressive design vocabulary that is not set in stone. It is one of several recent residential projects to emerge recently in the city that have departed from traditional facades. Indeed, Norten's design studies for this project are as exciting as those for Harlem Park and are sure to get a great deal of attention from the city's architectural community.